The house was freshly vacuumed, coffee brewed, Christmas music playing softly while we waited for our guests. Suddenly we caught the unmistakable whiff of a dirty diaper. The kind that lingers long after sanitation and emergency evacuation to the outside trash can. I was fresh out of simmering spices for the stovetop. Then I remembered--I had a small bag of whole cloves and tons of oranges. The room smelled great by the time we finished making simple pomanders. I think this will become a new family tradition. What a good idea for disguising that dastardly lingering odor. 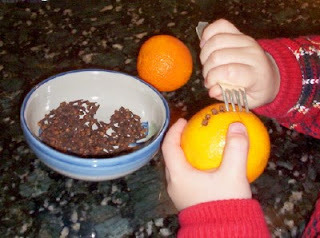 At Thanksgiving, we spelled out Give Thanks on oranges using cloves ... one orange for each letter. The challenge was how to display them. We ended up threading a red ribbon through them with the help of a bobby pin and tying a knot in the ribbon on either side of the orange to hold the orange in place. Then we hung the strings. We hung ours vertically, but horizontally probably would have worked, too. You can use a yarn needle to string the popcorn. It is a bit larger and you get a few more 'busted' pieces, but the blunt tip can't prick kid fingers. I usually wait a couple of days to string the corn, seems to be 'moister' and doesn't fall apart as easily. Thanks for the memory ... I remember making those a few times as a kid and remember the wonderful aroma they made. I made several pomanders, oranges studded with cloves, and tied ribbons on them and gave them as presents. Assembling them with my hands in front of the the tv, I felt less guilty about watching yet another rerun of "House."